A controversial appointment from the start, former Liberal Party politician turned senior bureaucrat Michael Caltabiano has been stood down from his position as Queensland Transport Director-General. Queensland’s Transport Minister Scott Emerson announced Caltabiano’s suspension late on Thursday, and that the embattled bureaucrat would vacate the post on full pay until an ethics committee investigation takes place. The matter, reported this week by Brisbane’s Courier-Mail newspaper, relates to a potential breach by Caltabiano for misleading Queensland Parliament about his work history. It’s claimed Caltabiano has a professional association with lobbyist firm Entrée Vous, which has been part-owned by Queensland Transport Department liaison officer Ben Gommers. Caltabiano has told Emerson he knows Gommers personally, but he did not have a professional association with the company. However it appears Emerson has distanced himself from his D-G by supporting Caltabiano’s referral to the Parliamentary Ethics Committee to investigate the matter. Caltabiano has been reported by the Courier-Mail as saying he has not received any payment for services provided to Entree Vous, and that it would be incorrect and inaccurate to assert he worked for the company. During an October 18 Transport and Main Roads estimates hearing, Caltabiano said he had known a staff member personally, not professionally. "I’ve been assured by Mr Caltabiano that this is the case," Emerson says. "However, I believe this is a matter that requires the appropriate scrutiny by Parliament’s Ethics Committee. "During this period Mr Caltabiano will be stepping aside as Director-General of Transport and Main Roads on full pay, under standard arrangements." Premier Campbell Newman courted controversy earlier this year when he appointed the former Liberal Party state MP to lead Queensland Transport, replacing long-time incumbent Dave Stewart. 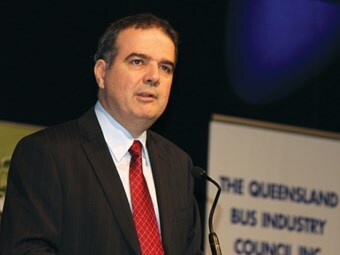 Speaking at QBIC’s annual conference in April, Caltabiano told delegates that there might be a ‘skewed perception’ of who he is, and that he was qualified to run one of Queensland’s largest public service departments. He pointed to his engineering training and early career with Queensland Main Roads before working in private industry on Sydney’s M4 and M5 projects. "I come to the department with both eyes open, with energy and vigour to turn the department around, and focus on building the state’s future – a task the Premier and Minister have given me to undertake," Caltabiano told delegates. Just on six months later, it now appears this grand plan has been derailed as Caltabiano prepares to face the ethics committee. Caltabiano could also face criminal charges if found guilty of lying to the Main Roads estimates hearing. TransLink Deputy Director-General Neil Scales will act in Caltabiano’s position until the matter is resolved.